Milk To Relieve PMS Campaign Strikes A Nerve. Period. If you blinked, you may have missed the controversy this past month over a “Got Milk” campaign “Everything I do is Wrong” which featured men suffering from the misery of their wives and girlfriends’ PMS symptoms and offering milk as the panacea. Clearly the intention was what we’ve all joked about-women are bitchy around their period and take it out on their guys. And now the men–the victims here–can fight back by offering their partners a full serving of the Milk Elixir to relieve their PMS symptoms (I personally think there wouldn’t have been such a backlash if it had been Chardonnay but that’s another story). Goodby, Silverstein & Partners, the agency for the Got Milk campaigns since 1993, designed the tongue-in-cheek web, advertising, and billboard campaign. They shut it down almost as soon as it went up after the deluge of complaints that hit their website, Facebook page, and other social media. Critics asserted that the campaign made men look like the ones suffering, not the women. In other words, the ads were sexist and soooo not funny. As an aside, there were also some complaints about the scientific validity to back up this noble claim about milk. But the heart of the controversy wasn’t about truth in advertising, it was about perception. What I found interesting about all the hoopla is that is five years ago there was a full-fledged TV commercial that had the exact same PMS gimmick. But guess what? No one complained, or at least enough to pull the commercial before the end of its run. This is likely because there wasn’t the powerful social media everywhere like now. In 2011, thousands are able to make their feelings known swiftly and strongly and get an immediate response. The agency even redirected the everythingidoiswrong.com site name to gotdiscussion.com to put a more “forum” spin on it. However, even a cursory review of the site will reveal, other than a two paragraph apology, that they are still cashing in on the negative publicity. What’s that saying…any publicity is good publicity. This campaign also caused me to examine my own feelings: was I personally offended as a woman? Did I think the campaign was funny? Was it “good” marketing? I questioned what exactly about the spin on the PMS caused such an uproar. Certainly it wasn’t that we were joking about PMS and periods, that’s been done a million times in jokes and media. Nor that it is a fairly awkward product to advertise, next to Depends undergarments and hemorrhoidal solutions. So why then does this Kotex U tampon commercial “work” about tampons and received praise from women? It’s also satirical and poking fun at something we all know but don’t really say out loud. I’m guessing it doesn’t raise the ire of women everywhere because the people making fun at themselves are the people who are affected — not someone else. I can make fun of me, but you can’t. 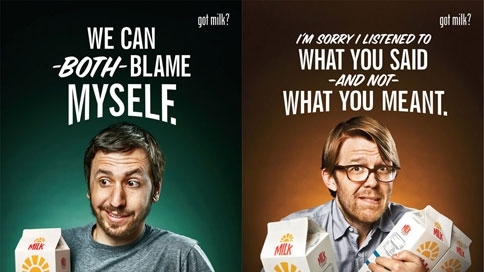 So maybe if the Got Milk campaign had featured women joking about their PMS symptoms and how milk helps them to deal with their men better, we might be praising the campaign instead and asking our significant others to pass the milk. How clever what a great article— only male corporate execs think of milk as a way to cope with PMS. The subtext is that if these women were barefoot and pregnant (aka farm girls or better yet, breeding cows) or perhaps more wholesome females who were at home and not in the workforce, drinking milk all day, they wouldn’t experience these symptoms in the first place and victimize their poor male partners so it’s a bit of a slap in the face to young heterosexual career women…OK I know this may be stretching it a bit but it wouldn’t surprise me if this was an underlying message…. Good post and a fun read! Hope you’re doing well.